Let’s face it. Relationships are complicated! We go to school to learn how to read and write. We learn how to add, subtract, multiple, and divide. We do science experiments and learn about our world’s history. We learn these important things and so much more, however, many of us are not learning the skills necessary to maintain long-lasting happy healthy relationships. Whether it is our past baggage that gets in the way (and it absolutely does), or we sabotage ourselves (which many of us do), most of us never learn and practice the skills we need to become relationship masters. After spending years researching relationships, counseling people in couples therapy, and teaching relationship classes, it is apparent to me that we don’t just automatically know what to do in our relationships. Without learning effective skills, our relationships usually aren’t very effective. Although they may come more naturally to some than others, relationship skills need to be learned. And no matter how much we know, there is always room to grow. It is no surprise that the divorce rate is so high. Many people go into marriage thinking that the intense infatuation high that comes with a new relationship will carry them through the peaks, the valleys, the conflicts, the resolutions, and the compromises (or the difficultly in compromising) that the years will undoubtedly bring. What they don’t sometimes (many times) realize is that there is a language that must be learned, a skill set that must be practiced over and over again, in order to maintain a satisfying relationship full of compassion, gentleness, trust, emotional safety, kindness, goodwill, patience, forgiveness, and love. Like playing the violin, performing a complicated dance, or performing surgery, skill and practice are needed if one is to be successful. A violinist, a dancer, and a surgeon don’t expect it to just turn out. They know they need to constantly educate themselves and apply what they are learning. Establishing and maintaining a healthy relationship is no different. Dr. John Gottman, renowned relationship researcher for over four decades, separates people into two categories- relationship masters and relationship disasters. Based on my own research (quite a bit of it coming from Gottman’s) here are some major differences between masters and disasters. Relationship masters are gentle with their partners and are considerate of their feelings. They allow their partners to express hurt and annoyed feelings without becoming defensive and turning away. Instead, they do just the opposite and gently turn toward their partner and inquire about their feelings in a compassionate way. They want to understand their partner’s perspective whether they agree with it or not. When their partner’s feelings are hurt and they feel they’re being attacked or blamed, they do not attack back. Instead they validate their partner’s feelings even if they disagree. They might say, “I can see you are really hurt, frustrated, and angry with me. Let’s talk about it.” They are kind and calm, even when they perceive they are being criticized. This promotes connection. Relationship disasters, on the other hand, become threatened when their partners express hurt feelings or frustration with them and go into fight or flight mode. If they go into flight mode, they turn away from their partner by refusing to listen, giving them the silent treatment, or threatening to leave the relationship. If they go into fight mode, they attack. By reacting with the fight or flight response, the relationship disaster effectively invalidates the feelings of their partner and creates an environment where it is unsafe to share feelings and frustrations. This shuts down communication and leads to disconnection. Relationship masters are skilled communicators. They take the time to get in touch with their own feelings before bringing up a concern. After getting in touch with their feelings, they choose their words carefully. Rather than literally pointing a finger at their partner and using the word “you” which puts people on the defensive, they begin their statements with “I”. They are able to look below their anger and get in touch with their hurt and communicate that effectively to their partner. Instead of saying, “Are you on your phone again? You are always on your phone!”, relationship masters might say, “I am feeling hurt, insecure, and unimportant to you. I want to spend time with you, and I feel like your phone is more important than me.” Relationship masters know that people are less likely to have a fight or flight response when they begin discussions with “I” statements and express concerns in a kind and gentle way. Relationship disasters aren’t cognizant of the hurt and fear that resides below their anger, and, as a result, their anger is the only thing expressed. They communicate in ways that feel threatening to their partner. Although they really want to be heard and understood, they approach their concerns in a way that puts people on the defensive. And when people are busy defending themselves, they are unable to really hear and understand the true message. Relationship masters know how to stop their fight or flight response system from engaging. They do this through mindful practice. They practice pausing before they speak so that they can think about how they want to respond rather than reacting off of pure emotion. They know their harsh words can damage their partner’s sense of emotional safety, and when a person does not feel safe emotionally they are likely to disconnect and withdraw emotionally and physically. Masters know that true intimacy is rooted in emotionally safety and do everything they can to stay away from their partner’s jugular (their most sensitive areas) no matter how upset they are feeling. They know certain topics are totally off limits. To read How to Calm an Angry Brain, click here. To read my post, The Power of the Pause, click here. Disasters react rather than respond when they perceive a threat. They don’t practice taking a pause to think about how to respond effectively. They react to perceived criticism by becoming defensive, launching a counter attack, or dismissing their partner’s feelings as unimportant or “no big deal.” Disasters don’t realize that these reactions shut down communication which breeds contempt and can lead to stonewalling. (Stonewalling is when one person has passed the point of contempt and feels so disconnected that they show no emotion at all.) For more information on relationship contempt turning into stonewalling (and what to do about it), read my article about The Four Horsemen here. Relationship masters are also masters of gratitude. They scan their environment for things that are good. They notice their partner’s strengths, their partner’s efforts, and their partner’s growth. Disasters scan the environment for their partner’s personal deficits. Their partner’s progress and growth often goes unnoticed. They focus on what is going wrong rather than focusing on what is going right. Relationship masters know this: What it takes to get their partner, it takes to keep their partner. They are playful and fun and do the work to keep the romance alive. Relationship disasters take their partner for granted and get too comfortable in the relationship. They no longer treat their partner with the same respect that they may have in the early days. They may stop taking care of themselves and stop doing the things that make their partner feel loved. They often maintain the status quo without really working on the relationship. Many times they ignore the signs of an unhappy partner and an unhealthy relationship only to wake up when a partner wants to leave. If you have identified with the relationship disasters, it is not too late. Relationship disasters can become relationship masters with a tool box full of skills and a lot of practice. I often tell my clients that you cannot change something until you know what it is you need to change. By identifying with some of the characteristics of relationship disasters, you have taken the first step toward change. The next step is to learn what the relationship masters have been taught and have been practicing. Below you will find resources to get you started. While educating yourself begin to practice what you are learning. Remember, if you have acted in a certain ways for years, it will take lots of practice to behave in a different way. Be patient with yourself and focus on progress rather than perfection. After all, even the masters have their bad days. I want to share with you some of the things that I have learned over the years. The following information has been extremely helpful to me and my clients. I am hopeful that it can help you, too. Resources from my blog at www.thesnowballeffect.com. 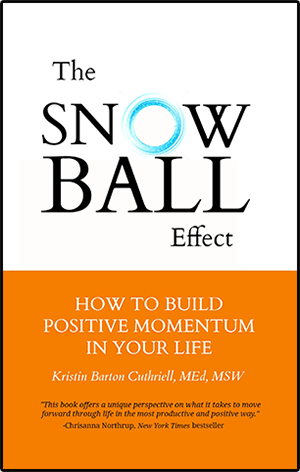 In my book, The Snowball Effect: How to Build Positive Momentum in Your Life, I have combined evidenced based tools with stories that touch the human spirit to help people improve all of their relationships. The information in this book is used in all of my seminars and classes. 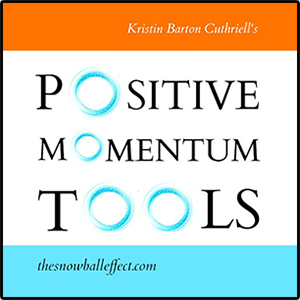 It covers letting go of resentment, harsh self-judgments, and explosive reactions. It also discusses ways to move forward following difficult challenges.